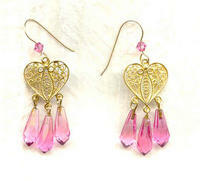 The vintage rose crystal drops were hand faceted in West Germany some time in the 1950s. They are a much prettier colour than the scan shows, and the colour is a true, clear rose pink. 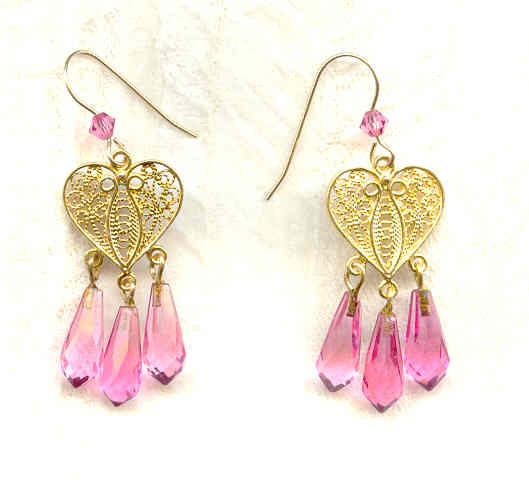 Each is about 5/8 inch long, not counting the loop; and each earring sports a trio of them dangling from a vermeil (22kt gold plated over sterling silver) filigree heart. The earrings measure 2 inches from the tops of their 14kt gold fill French hooks (embellished with 4mm Swarovski rose bicone beads) to the bottom of the longest rose crystal. Beautiful and playful at once, they're from SPARKLE PLENTY, of course. The matte rose crystal semi circle is patterned with daisies and is prong-set in a silver toned piece stamped 'Freirich' on the back. Nearly iridescent, these dainty rose seahorses were moulded in West Germany in the 1950s.